Saturday 17th June 2017 - Wall to wall sunshine but still windy. Yesterday we were on a bit of a mission to get thing's done! We needed shopping, fuel and LP|G (gas), and our journey was to be about 80 miles to our next destination which was The Dingle Peninsula. However, we only managed 2 out of 3! We left our Loop Head wild camp and descended back down the narrow roads to the town of Kilrush, and as we went we passed doe eyed calves, bandy legged foals, and dozzy donkeys all munching their breakfasts. Then after we'd restocked at Aldi and Tesco, we headed to Killimer from where we caught a little roll on roll off ferry across the Shannon to Tarbert. This saved us a very long drive around the Shannon Estuary which would have cost us dearly in both time and diesel, so as the fare was only 21 euros we thought it was money very well spent! And once back on solid ground we wound our way passed the Blennerville Windmill - apparently the tallest one in Europe - and on towards the town of Tralee where we thought we'd be able to collect some LPG gas - but alas there was none to be had! But luckily we're not desperate yet, and as we'll be on a campsite for the next few days we won't need much in the near future. So with no further messing we headed straight for the Anchor Campsite which sits just outside the settlement of Castlegregory on The Ring-O-Dingle. There we were made very welcome, and also offered a discount of 4 nights for the price of 3 - so this will be home till Tuesday. Anyway, back to Saturday now! This morning we'd planned to go out on our bikes, but as the wind was still howling we quickly changed our minds and went for a walk instead. 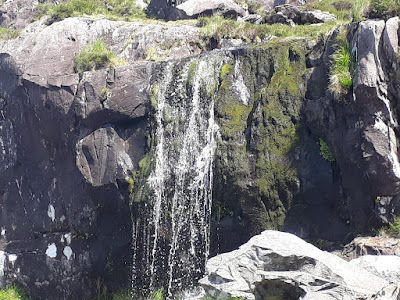 And for this we chose Glanteenassig Forest Park as our target - it's said to be a valley of waterfalls and lakes and a place that lies in a sheltered spot amongst the Slieve Mish Mountains - however it certainly wasn't very sheltered today - the gale fairly howled through! But it was another stunning setting even though it had obviously undergone a huge amount of forestry work in the form of tree felling - that just added to it's mystical grandeur especially near the lake sides. 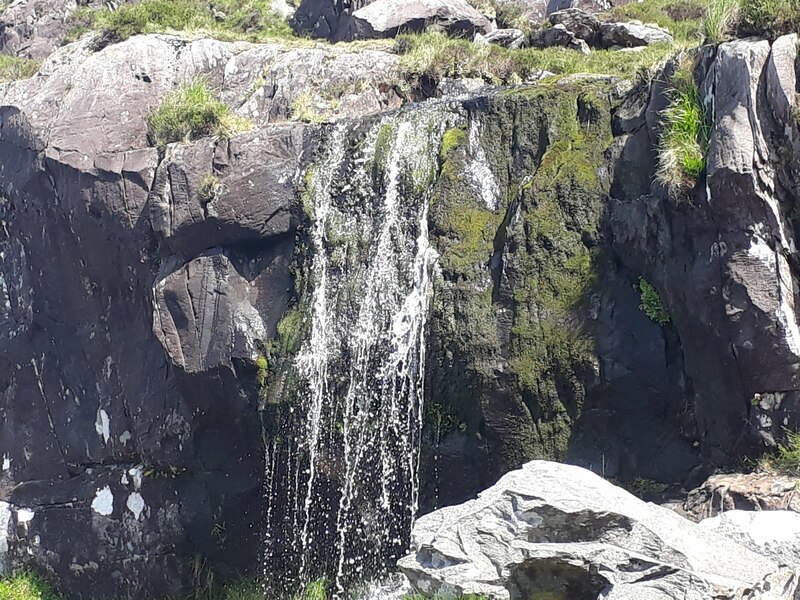 We walked up the valley beside the Owencashla River following trails that offered lovely views, and to keep us company the river tumbled, gushed and chattered as it went. Eventually we arrived at Lough Caum and from there we circumnavigated the lake on a board walk, and as we went the landscape opened up to reveal the full majesty of the valley with a 360 degree vista of mountains, forest, waterfalls, lake and valley, and it also provided another splendid dining room for lunch. Then, once we started our decent back down the hill towards Castlegregory we enjoyed more panoramic ocean scenes, and we could even easy make out the Loop Head Peninsula were we'd spent the last couple of days. The colours in the ocean were also quite breathtaking as the water sparkled in the sunshine - if our surroundings hadn't been quite so green it would have been easy to think we were somewhere more exotic! Like most of the rest of England, for us today turned out to be a scorcher - so what did we decide to do? Cycle up a very big hill to Brandon Point, which to the east provided fantastic views over Brandon Bay, and in a more north easterly direction we could once again see as far as Loop Head. It took us a couple of hours to get to our destination, so as it was such a lovely day we felt quite entitled to have a break in the little hamlet of Brandon itself - right by the pier where others lazed in the sunshine and where we found a very welcoming pub - but we didn't want to drink and ride, so on this occasion we resisted that temptation, and instead indulged in jammy scones and coffee while we watched a young lady wobbling on her paddle board. After our indulgence was complete we continued on towards our goal, and as we neared the point itself the views became increasingly stunning, but the top turned out to be a false one - the car park had fantastic views but to get to the very top of Brandon Point you needed to continue on foot - John stopped with the bikes while I scampered a little way up but the hill seemed to be never ending and it would have taken a huge amount of time and energy - so I gave in gracefully and came back down! John taking it easy while I climbed the hill! However, while we were there we did take the time to learn about the Voyage of St Brenden the Navigator who is believed to have fasted for forty days on top of Mount Brandon in preparation for his seven year voyage to find the Isles of the Blessed. It's said that on his journey he encountered sea monsters and demons from hell, and the island on which he lit a fire turned out to be a whale! Therefore, were the Isles of the Blessed (North America) discovered a millennium before Christopher Columbus? In 1976 an adventurer,Tim Severin, sailed to Newfoundland in a replica of Brendan's currach, proving that the voyage was possible! We finished our day off by sunning our selves in our 🌷🌷garden 🌷🌷campsite, and the day seemed to never end cos at 11pm it still wasn't properly dark! Monday 19th June 2017 - Another lovely hot day with almost wall to wall sunshine! So today we John decided we'd go up another big big hill - this time we were going to the top of the infamous Coner Pass - and T4rdis2 just wouldn't fit! Yesterday we'd seen signs declaring a 2 ton weight limit, a 1.8 metre width limit and 7.2 metre length limit, so that discounted our big ship on all 3 counts. But we'd read that Coner Pass is one of the highest and most scenic roads in The Republic of Ireland and we certainly didn't want to miss it! Therefore, we set off with fully charged bike batteries and plenty of water, but in the end, although it was steep in places, the climb was relatively easy on our trusty steeds! John did leave me a bit behind at times but I made it in the end! To start with the road was a comfortable 2 lane highway with a reasonably good surface, but just after half way up we came to a view point from where Pedlar's Lake can be accessed by following the stream uphill. Then after that our way became much narrower and weaved it's way around sharp cliff faces and past more high corrie lakes (lakes formed by glacial activity over 2 million years ago), until we eventually reached the summit plateau. And there we heard a macabre tale - in 1950 the body of a child was found in a bog near the Coner Pass, and it was thought to date back to the 7th or 8th century! The story goes that the body was very well preserved by the peat, and that she had red hair, a dress and carried a bag that contained a ball and a comb! From the top the views spanned nearly 360 degrees with the town of Dingle and far reaching sea views in a Southerly direction, and on the side we'd ridden up the vista stretched from Cloghane then out to sea with maybe hazy glimpses of Galway in the far distance. It made a perfect dining room for today! 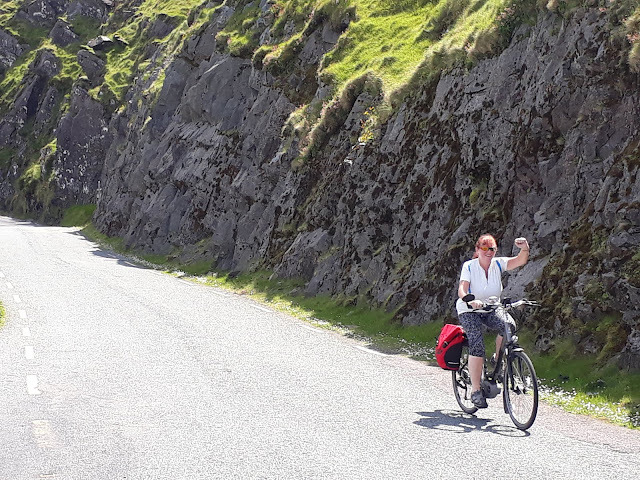 And although some may say we cheated a bit because we went up on e-bikes, we still had to peddle hard - therefore, I think we deserve a bit of a pat on the back because our guide book informed us that this ascent is one of the most difficult climbs in Ireland. However, rather than a pat on the back we both decided we'd rather have a nice cooling glass of cider when we got home 🍻🍻 so as we sat in the late afternoon sunshine back at T4rdis2 that's exactly what we did! Tuesday 20th June 2017 - Lots of sunshine but with some hazy cloud at times. This morning we left The Anchor Campsite knowing we more or less HAD to fill up with LPG, but we were quite confident because the site owners had told us that a garage back at Blennerville (which was only about 6 miles back off The Dingle Peninsula) had it. But Oh no they didn't! However, a very informative Irish gentleman there told us if we backtracked to Tralee we would find some at Nolan's Service Station - so with some trepidation off we went! And YAY they had some, but the pump didn't seem to work so we really thought we were in trouble - however once we read the sign that said 'NOT SELF SERVICE' and got a bit of help we were soon sorted. Then it was back onto The Ring-O-Dingle and along the main road to Dingle town itself where we had thought we might stop - but it was heaving and every available space had either a car, a coach or a motor home parked on it. So without hardy a touch on the brake pedal we shot straight through - if it's any quieter on Thursday when we leave this area we might stop, but if not we'll just satisfy ourselves with what we see from T4rdis2's windows. Anyway, we soon got settled and our pitch, once again, has sea views and is only 800 metres from the Dingle Way Walking Path. Additionally, The Slea Head Route is within cycling distance, so as we're only staying here for 2 nights I think it's going to be a hard decision as to how we're going to spend out time! Maybe we should make a plan - but whatever we do I'll let you know in our next episode!